The Patriot Dirt Late Model, Drit Modified Race Car Side Wrap. 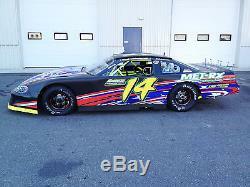 This high quality race car side wrap kit is printed on air release vinyl and is for 2 panels 150" wide x 24" tall each. This kit can be used for any type of race car. All of our artwork is custom made. This is an original FireStorm® design and cannot be found any where else. 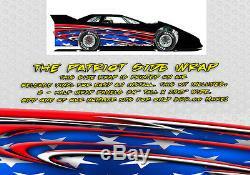 The item "The Patriot Dirt Late Model, Dirt Modified Race Car Side Wrap American Flag" is in sale since Friday, May 4, 2018. This item is in the category "eBay Motors\Parts & Accessories\Car & Truck Parts\Decals/Emblems/License Frames\Decals & Stickers\Racing Decals". The seller is "stickerhog" and is located in Manchester, New Hampshire.